My first surfing lesson at Penmarc'h, Pays Bigouden. When we think of surfing, we imagine a young, slim, cool ‘dude’ with fair hair, bleached by the sun riding gigantic rolling waves on the other side of the world…definitely not for us ! But if there’s one place in France that can lay these ideas to rest, it has to be the Pays Bigouden ! 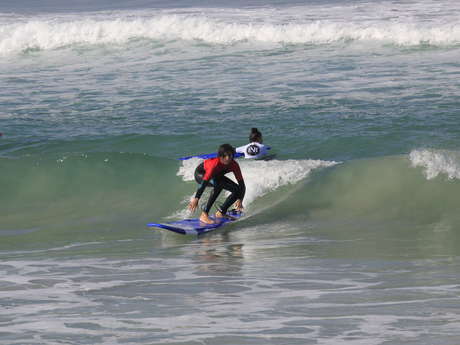 The southern part of the Bay of Audierne has a range of Surf Schools to choose from. I’m not a very sporty person and not very confident in the sea, so I never imagined I was going to have such a thrilling experience. Right from the start, we are well looked after by the instructors, who warn us of the dangers of the sea, teach us how to understand it andstress the importance of helping one another in the best possible way. We put on our wetsuits, pick up our boards and set off down the beach. At Pors-Carn that day the waves were quite gentle for beginners, just right for me. First of all, the instructor shows me what to do on the sand and I practise standing up quickly on the surfboard. It seems so simple…on the sand ! Then comes the moment of truth ! It’s time to practise our technique in the water. As always, the sea is a magnificent blue with gentle waves. Olivier, my instructor explains what to do once again and gives my board a push to give me optimum speed on the wave. First attempt…. a total failure. Second attempt... I push on my arms, bring up my knees and put my feet flat on the board, albeit for only a fraction of a second, but I’ve done it ! My success spurs me on. On the third attempt, the board picks up speed along the wave and I stand up. I stay upright for 1,2,3,4,5 seconds until the wave dies. 5 seconds which seem like an eternity, but are long enough for me to feel very proud ! I manage another 3 successful waves, all on my own ! And I lose count of how many times I fall off. 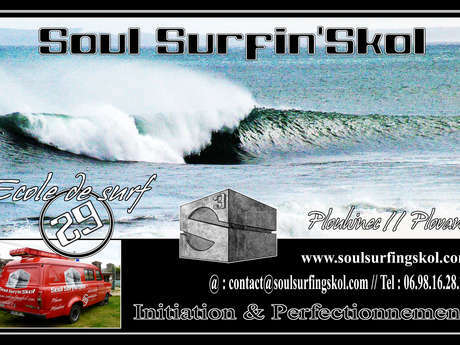 But I've understood that in the positive world of surfing it’s successes that count not failures !